Considering SimplePractice, but not sure it’s the best fit for your practice? Getting a headache trying to compare costs and features between the different platforms, such as SimplePractice versus TherapyNotes? Deciding which billing and software tool is right for your practice takes time and careful consideration. If you’re considering SimplePractice, read on for our comprehensive guide. And once you’ve gotten a good overview, learn what other therapists prefer, too! 2. What does a SimplePractice plan include? 3. How much does SimplePractice cost? 4. Is SimplePractice HIPAA compliant? 5. Where is the SimplePractice login? 6. Does SimplePractice offer a free trial? This guide has been reviewed and confirmed by SimplePractice as of January 2019. SimplePractice is a healthcare practice management software with a dedicated client portal. It is designed for healthcare professionals of all kinds and offers tools including scheduling, billing, and notes. What does a SimplePractice plan include? SimplePractice offers two different plans, Essential and Professional. The Essential plan includes most, but not all, of the below features. Features that are only included in the Professional plan are marked accordingly. SimplePractice gives you a variety of options for documenting your clients’ treatment. Easy access to notes and documentation. Notes function includes a searchable library of thousands of ICD-10 codes. 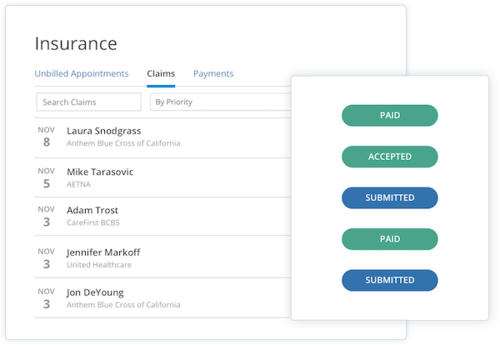 SimplePractice can help you manage billing, invoicing, and payments through both individuals and insurers. Your plan includes credit card processing, as well as the option to store credit card payment information. Offers the option to mark payments as cash or check and to automate payment collection. SimplePractice offers scheduling tools for both you and your clients. Scheduling tools can be synced with your iCal, Google, or Outlook calendar. Paperless intake forms, which can be sent to you before a client’s first appointment. Credit card payment information, which can also be processed through the portal. Access to superbills and invoices. SimplePractice is compatible with iOS and Android. The SimplePractice mobile app includes schedule management, invoicing and payment processing, intakes, and viewing and managing client info and notes remotely. How much does SimplePractice cost? The Professional plan costs $49 and includes all SimplePractice features. The Professional for Groups plan also costs $49 per month, with each additional clinician costing $29 per month. Telehealth through SimplePractice costs $10 per month per clinician. Yes, SimplePractice is HIPAA compliant. You can find more details about SimplePractice’s privacy and security practices here. Where is the SimplePractice login? You can find the SimplePractice login at https://secure.simplepractice.com/users/sign_in. Does SimplePractice offer a free trial? Yes, SimplePractice provides a free 30-day trial. “The defining feature/reason I chose Simple Practice over other practice management software options was their fully electronic intake process. This is part of our series on choosing the best billing and practice management software for your needs. For further reading, visit our reviews of Office Ally, TheraNest, and TherapyNotes. We also have a guide to choosing the right therapy billing + practice management platform for you.